110 will address major projects on I-25, I-70 and the state highways that connect our communities throughout Colorado. Local governments will have full flexibility of their share of the funding, allowing our communities to meet their diverse needs throughout the state. 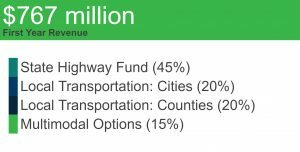 Multimodal funding will support transportation options that decrease traffic congestion and protect our air quality. This funding could be used to support urban and rural bus service, large scale bike lanes and paths, and improvements for pedestrians. This entry was posted	on Monday, October 8th, 2018 at 9:21 am	and is filed under Blog, Front Page, Uncategorized. You can follow any responses to this entry through the RSS 2.0 feed. Responses are currently closed, but you can trackback from your own site.